LIVE VIDEO: Georgia Gubernatorial Debate - Joe.My.God. Republican Brian Kemp and Democrat Stacey Abrams will face each other Tuesday night for the first televised debate in one of the country’s most closely watched races. The 7 p.m. debate will air live on Georgia Public Broadcasting’s TV and radio stations. Georgia voters are clearly energized. About 632,000 people had already cast a ballot as of Monday. Election Day is Nov. 6. 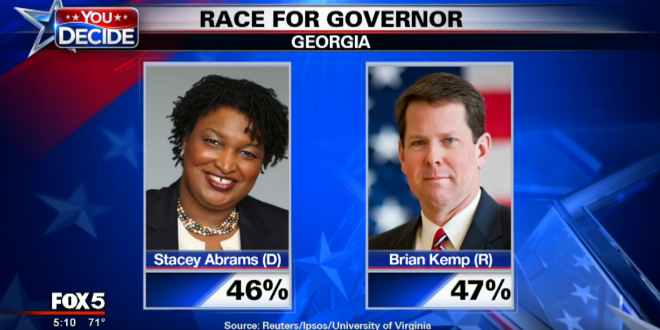 The race – featuring Secretary of State Brian Kemp and former state House Minority Leader Stacey Abrams, who could become the first black female governor in the country – is locked in a dead heat with just two weeks left. The debate will be live-streamed on Facebook.